Now’s the time to visit Ukraine! It’s an exciting time of progress and challenges with Ukraine’s evolving new identity post-Soviet rule. Still in its infancy of tourism, prices are reasonable (compared to Western standards). 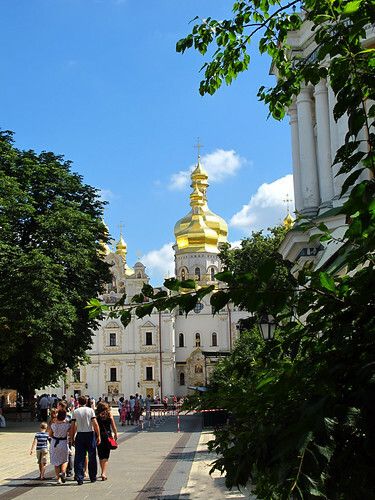 The historic churches, monuments, top-notch museums are amazing, the mountain vistas and beaches are dazzling, and then there is the famed Ukrainian hospitality. 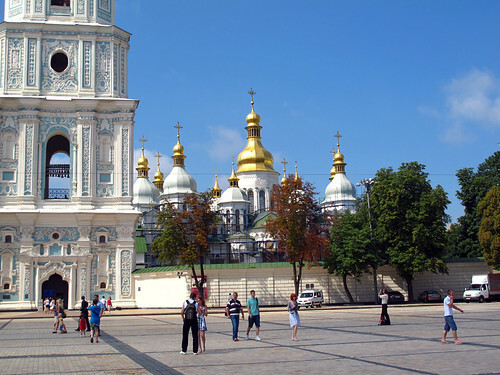 Kyiv (Kiev) is as cosmopolitan as many western European capitals. Yet it is rich with icons of its medieval history and many have been rebuilt and restored after WWII destruction. 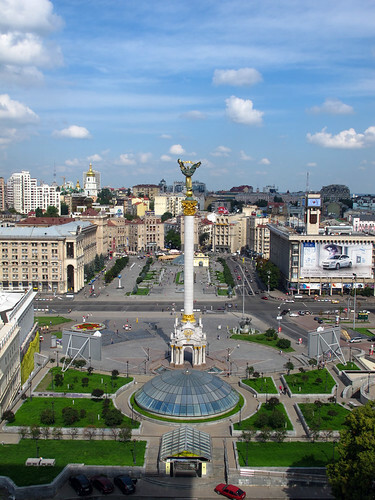 The main streets of this once model Soviet city flaunt pompous Stalinist architecture, while the western Ukraine’s city of Lviv is the heart of Ukrainian nationalism. Its Old Town is packed with original Gothic churches, and walls and towers dating back to the 14th century. 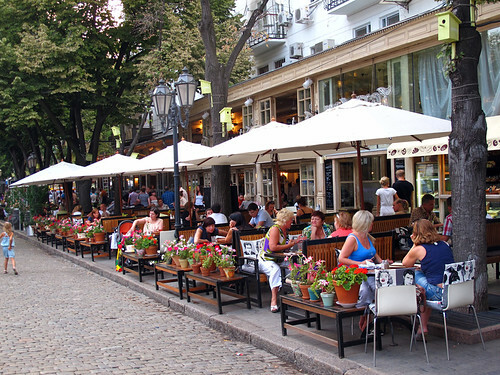 The southern town of Odesa and the mountainous Crimea area have attracted vacationers with their balmy climate and Black Sea beaches since the time of the Tsars. Passports are required to enter and leave Ukraine.Many countries (including Canada, US, and EU countries) can now enter Ukraine visa-free and stay up to 90 days. Ukrainian became the sole, official language with Independence in 1991, though most Ukrainians can speak both Ukrainian and Russian with equal ease. Ukrainian is preferred in the west, whereas in the east Russian and Ukrainian are equally spoken, and in the south Russian takes the lead. In areas surrounding the large eastern and southern cities, a hybrid of the two languages (Surzhyk) is often spoken. The Cyrillic alphabet can be a real challenge for travellers, so it is useful to carry a Ukrainian phrasebook in order to recognize signage in Cyrillic script. 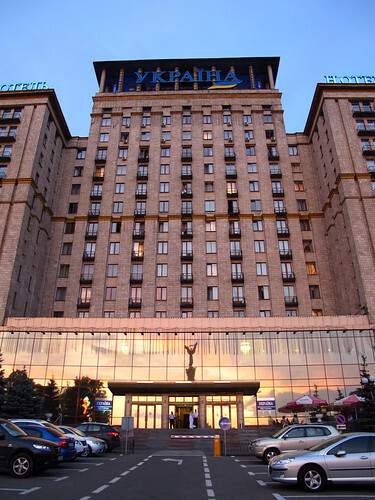 It is recommended that you pick up “Kyiv in your pocket”, city guides /maps (also for Odesa and Lviv) from your hotel which has both the Cyrillic and English names of streets/hotels, plus other useful information. Spelling of cities/sites – With Ukraine’s newfound nationalism Ukrainian spelling is preferred (although Westerners may be more familiar with the Russian spellings). Check this link for day-to-day updates on exchange rates for US and other currencies. If you want to show-off your grammatical ability – the plural forms of hryvnia and kopiyka are “hryvni” and “kopiyky”; genitive forms “hryven” and “kopiyok”. Russian pronunciation for hryvnia is “grivna”. ATM’s and foreign currency exchange offices can be found even in small cities. Avoid bringing Traveller’s Cheques as they may be hard, if not impossible, to use. Ukraine is not what you would call disabled-friendly; city streets lack curb ramps and public transport systems lack even a hint of accessibility. Office buildings, restaurants, shopping facilities for the most part are not readily wheel-chair accessible. An international drivers license is needed (acquired in home country) as well as a license from your country of origin. 220 volts AC, 50 Hz. Type(s) of plugs/sockets – All sockets require two round pins, but not always the same size. Adapters are not easy to find, so bring your own. Ukrainians may seem cold at first glance, as they seldom smile, especially in big cities. But don’t let that fool you – they are a warm and welcoming people – and any engagement will produce friendly smiles. A firm handshake with direct eye contact is a common greeting. More informal greetings – close female friends will cheek kiss three times, starting with the left cheek. Close male friends pat each other on the back and hug. Superstitions: It is considered back luck to shake hands with gloves on, or to shake hands or hand something to someone over a threshold. When gifting flowers, be sure there is an uneven number of flowers in the bouquet (even numbers are for funerals). 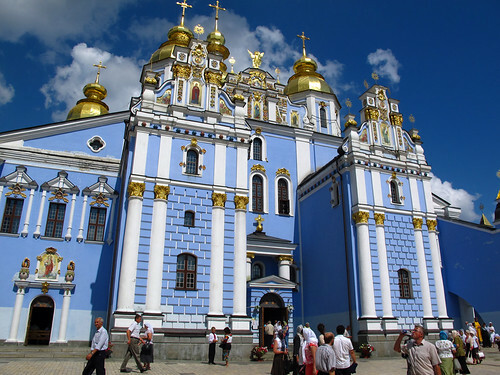 Orthodox Church etiquette – 97% of Ukrainians are Christians, and most follow some sort of Orthodoxy. When visiting churches women should have their heads covered with a scarf of some kind, and below-the-knee skirts (bring along a wrap-around skirt if you don’t want to wear a skirt all day). For men – no shorts and arms should be covered for both sexes. Belarus, Hungary, Moldova, Poland, Romania, Russia and Slovakia. For the most part, Ukraine is a safe country. Large demonstrations occasionally take place in the bigger cities, such as Kyiv. They are usually sponsored by individual political organizations, and most have been peaceful. Most reported street crimes are non-violent and non-confrontational, ranging from various scams to simple pocket picking, purse snatching, and theft of personal items from parked rental cars. The extremely people-packed metro subway system is one of the prime locations for pick-pocketing. Ukraine recently outlawed smoking in most public places as well as the workplace, and is only permitted in specially designated areas. Each business establishment is responsible for providing a designated area for all smoking patrons or personnel, but since the law is relatively new not every business has begun to enforce it. This is especially true in bars and clubs where you are never far away from a lit cigarette. Ukraine is 2 hours ahead of Greenwich Mean Time, or GMT. Daylight Saving Time is from late March till late October. Clocks are set one hour forward in the last week of March and one hour backward in the last month of October. Interior Ukraine has a moderate-continental climate – average summer temperature is 23ºC (73ºF). July is the hottest month with temperatures that may reach 35ºC (95ºF). The average winter temperature is -9ºC (16ºF). Odesa, located on the Black Sea, is still considered to be in the same climate zone, but has milder winters with temperatures hovering around OºC (32ºF). Precipitation is disproportionately distributed in Ukraine; highest in west and north, lesser in east and southeast. The steppes and coast of Crimea in south-eastern coast has a Mediterranean climate; with an average summer temperature of 24ºC (75ºF), while the average temperature in January is 7ºC (44ºF). 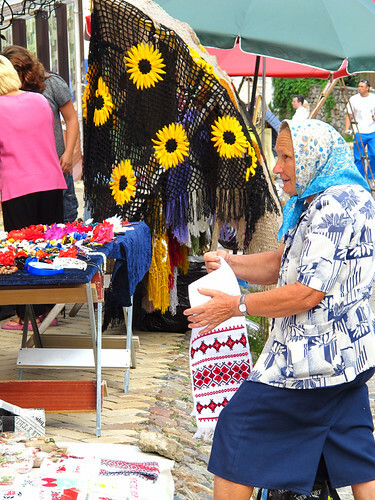 Tourism peaks from June to August throughout Ukraine. 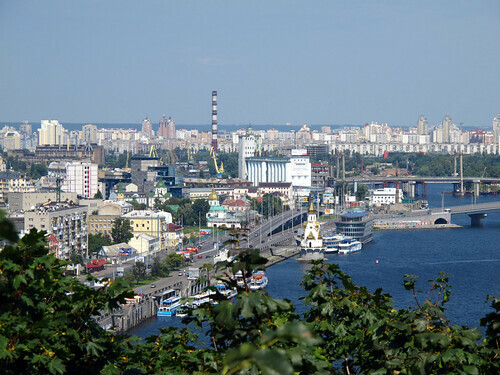 Boat tours along Dnipro (Dnieper) River and Black Sea operate from May to September. From June to September – the average sea temperature exceeds 20 °C (68 °F). Independence Square (formerly Maiden Nezalezhnosti) renamed after the collapse of the Soviet Union in 1991, is an outstanding place to spend the day to soak up the culture and monument gaze. 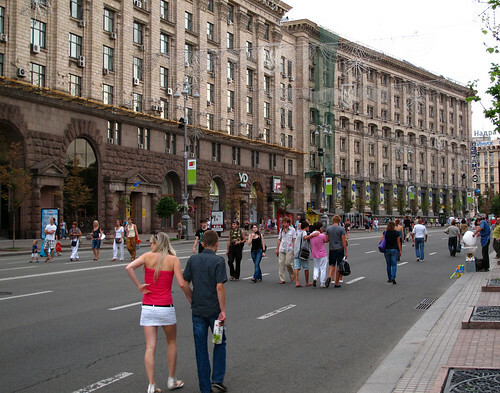 The famed Khreshchatyk Street, filled with sidewalk cafes and premier shops, bustles with contagious energy. Orthodox churches, including the cradle of Eastern Orthodoxy, the Caves Monastery, where 1000-year-old mummified bodies of monks lie in the caves. St. Sophia Cathedral and the Caves Monastery are Unesco World Heritage Sites. The Chornobyl Museum is a must, unless taking a day-trip to the actual site. Go off the tourist-track to the rows drab grey rectangular housing blocks most commonly associated with communism. 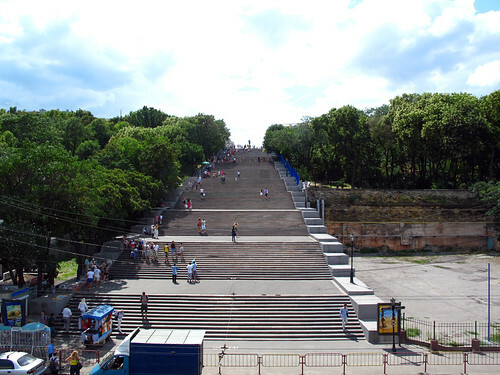 Spend time on the shores of the Dnipro River lined with vast parks and gigantic monuments. Luckily escaping WWII bombings, Lviv holds a wealth of original historic buildings blackened by time down a maze of alleys (Unesco site). A walking tour will transport you back to the middle ages, as well as the wonders of numerous 18th century religious buildings with architecture as varied as the changing rulers over the centuries. Lychakiv Cemetery, for example, is one of the stunningly, beautiful cemeteries in Easter Europe. Museums of all sorts abound in this laid-back gem of a city. South of Lviv is Ukraine’s largest natural park (503sq km /194sq miles), and the country’s highest peak, Mt. Hoverla at 2062m (6765ft). Winter’s downhill and cross-country skiing and summer’s hiking and camping make it a year-round location. Hutsuls, a people descended from a nomadic horse, still live in the park. This Black Sea port and resort city of one million people offers visitors many great, relaxing beach-time options as well as a fabulous mix of interesting sites, including “The Catacombs of Odesa”. The Crimea Peninsula was fought over for centuries, as evidenced by the Crimean War of 1854-56, where Florence Nightingale made headlines. In the 1860’s it became a summer leisure spot for the Russian Imperial family, who left palaces in their wake, all of which you can visit today. The resort town of Yalta, snuggled against the sparkling Black Sea is a heavenly haven. The most spectacular trips in the country are by road through the jagged Crimean Mountains to Yalta. NOTE for Canadians as of 2016 – If you choose to travel to Crimea despite the current advisory, you must first obtain a special permit from the State Migration Service of Ukraine. The Ukrainian government requires that this permit be presented, along with your passport, at designated checkpoints along the administrative boundary of the occupied Ukrainian territory. Visit https://travel.gc.ca/destinations/ukraine for more details. Citizens of other countires are advised to check with your local officials for up to date requirements for visiting the Crimea region. Taras Shevchenko – a great poet; exiled in 1847 for his satirical poems about Russian oppression. Lesia (Lesya) Ukrainka – (1871-1913), a wealthy young women of frail health known for her moody poetry and for her political, civil, and female activism. Ivan Franko – a famed 20th century writer who’s work shed light on the Russian occupation, and who was, of course, imprisoned by the Russians. 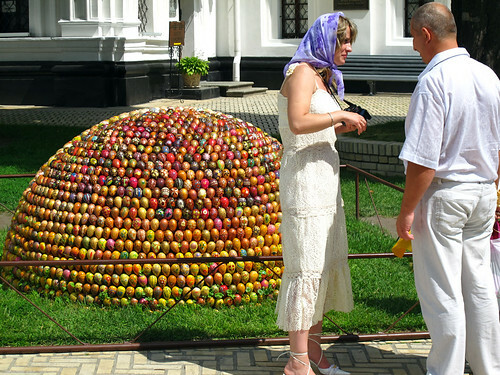 Uniquely Ukrainian Art: Pysanky – brightly coloured, intricately designed eggshells. They are sold during Easter season, but are also available in wood year-round and they pack much easier. Almost all international flights use Kyiv’s Boryspil International Airport (35km or 22mi east of Kyiv). International passengers arrive and depart at two terminals; B and E.
– Taxies wait at the exit of the terminals – the 30-45 minute ride to the city centre should cost between 150-250 UAH. – Buses headed for Kyiv leave terminal B roughly every 30 minutes (cost approx 25 UAH) and will drop you off at the Central Train Station, from which you can take a taxi to the city centre for about 35 UAH. Another option is to take a short walk from the Central Train Station to the Metro Station (subway). Just ask anyone “de stantseeya metro?” and they will point you in the correct direction. – Metro Station – purchase tickets (2 UAH) for the subway system – these subway trains are always jam-packed, so if you have lots of luggage or are not sure of your stop it may be best to take a taxi. The smaller Kyiv Zhulyani Airport handles mostly domestic travel (8km or 5mi from central Kyiv). All international buses arrive at Kyiv’s central bus station at the, Moskovs’ka Ploscha Square. Taxis are on hand to take you to the city centre (approx 50UAH). Buses also leave from here for other cities in Ukraine. Car rentals are available at most major hotels or car rental companies. An international driving license is needed (acquired in home country) as well as a license from your home country (you will also need nerves of steel). If you have driven in Mumbai or Mexico City you may qualify, that is if you also know how to read signs in Cyrillic. Otherwise, it’s better to use a local Ukrainian driver with his own car. Train travel is frequent, efficient and cheap. They leave to and from all surrounding countries and between Ukrainian cities. You can travel by ship from Odessa, or Yalta, as well as various cities on the Black Sea and Mediterranean. The most frequent and reliable is the Odessa to Istanbul route. It’s also possible to sail down the Danube River between Odessa and a number of East European river ports. 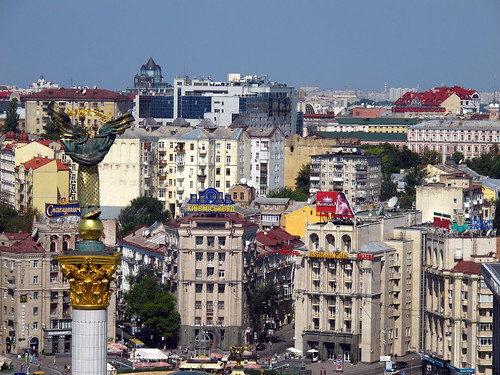 Taxis – metered taxies are difficult to find in Ukraine and you will need to negotiate the price with the driver. Foreign travelers are, of course, at a disadvantage, so be sure to settle on an amount before getting into the cab. Having the reception/concierge personal at your hotel order your taxi by phone with a price quote may help to avoid surprises. Buses, trams and trolleybuses readily available to shuttle passengers to most all destinations. It is best to purchase tickets at the bus stop “kiosks”, however you can also get your ticket from the conductor once you board. The Ukraine public transport system uses a simple tariff system regardless of distance travelled: tickets for ground transportation must be purchased each time a vehicle is boarded. The next most popular form of transportation in Ukraine is the many privately owned MicroBuses (Marshrootkas). Their coverage includes smaller residential streets as well as routes and schedules that are convenient for all. You can ask the driver to stop the bus nearly everywhere and you can flag it down to stop for you nearly everywhere, as well. However, without knowledge of Ukrainian or Russian language, riding a marshrootka can be a challenge. Older ladies (babushkas) holding signs advertising rooms or apartments for rent line the exits of bus terminals, and airports. If you are fluent in Ukrainian or Russian, this may be an option. Hotels range from Luxury and 5-star to bargain hotels, apartment hotels, guest houses, and hostels. The “rack rate” for Luxury and 5-star hotels may be up to $900 US per night, 3-star $200 US, down to $50 US for a room/with shared bath in a hostel. – Where’s my klyootch (key)? The majority of hotels (especially older hotels and hotels in the budget to 4-star range) have a desk on each floor where a “key-lady” is on duty 24-hours to hand out or take back your room key in conjunction with your “comings or goings” (albeit she may have to be woken up from a nearby sofa at night). Newly built hotels, and most of the luxury and 5-star hotels have electronic keys that the guest keeps with them during their stay. Also, all regions have their own national regional days. When returning to the US or Canada you will be required to declare everything you are bringing back (that you did not take with you). You will be required to fill out a Customs Declaration Form. Keep your sales slips. US and Canadian citizens over 18 years of age (19 in some Canadian provinces) may bring goods into or from Ukraine up to a certain value before having to pay custom duties, excise taxes or VAT (Value Added Tax). This includes a specific amount of tobacco and alcoholic beverages. For other items there may be no restriction on amounts, as long as the value does not exceed the monetary limits allowable. Also check for what items are prohibited. (As per customs websites). See this link for complete information on U.S. Customs. See this link for complete information on Canada Customs.